Hospitals and health trusts in England have been told by regulators to look again at their financial plans as current ones are "simply unaffordable". Monitor has written to the 46 foundation trusts with the biggest deficits "challenging" their plans. It urged money-saving measures such as filling only essential staff vacancies. The Department of Health supported the move, but Labour argued it suggested there was a financial crisis in the NHS that was "spiralling out of control". David Bennett, chief executive of Monitor, said the NHS was facing an almost unprecedented financial challenge this year. "We are already reviewing and challenging the plans of the 46 foundation trusts with the biggest deficits," he wrote in a letter to trusts. NHS trusts are caught between a rock and a hard place. On the one hand they have the number crunchers - like Monitor - demanding they keep a tight control on the finances and on the other they are being asked to ensure standards don't slip. This is only likely to get worse. While the NHS has been promised an extra £8bn a year by the end of this Parliament, it is being asked to make £22bn in efficiency savings to plug the predicted shortfall of £30bn by 2020. That is a monumental task. Within the health service there is a desire for the £8bn to be front loaded in November's government spending review - that is to say they want all or most of it from next year rather than seeing it gradually dripped fed in over the years. That, so the argument goes, would allow them to get a grip of the deficits and make the changes needed to (hopefully) improve efficiency. The next year or two is crucial for the NHS. "However, it is clear that this process will not close the funding gap and so we need all providers - even those planning for a surplus this year - to look again at their plans to see what more can be done." He urged trusts to leave non-essential vacancies unfilled, and to follow guidelines on safe staffing in a way which was "proportionate and appropriate". Rosters should be rigorously managed to deploy staff efficiently across all required shifts, including evenings and weekends, he said. In May, NHS trusts in England reported a total deficit of £822m in 2014-15, compared with £115m the previous year. A big rise in spending on agency nurses contributed to the deficits. At the time, Monitor said figures for this financial year were likely to be even worse. Shadow health secretary Andy Burnham said the warning by Monitor "suggests that the financial crisis in the NHS is threatening to spiral out of control and hit standards of patient care". He added: "The suggestion that hospitals can ignore safe staffing guidance will alarm patients and the government must decide if it will overrule this advice." The Department of Health said it was investing £8bn into the NHS in England so that it could implement a five-year plan, and it was vital that "every penny possible" was spent on patient care. The provider sector has forecast a total deficit of more than £2bn for 2015-16, according to specialist resource Health Service Journal. Chris Hopson, NHS Providers' chief executive, said it was a systematic problem with around 80% of NHS trusts were predicting a deficit. 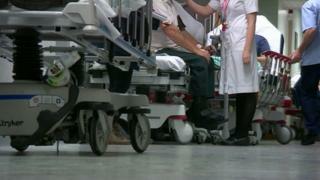 Dr Mark Porter, the British Medical Association's council chair, warned services could suffer. "If trusts are to face an even greater squeeze on funding and staff then the only way to increase consultant presence across seven days is to reduce the number of senior doctors providing elective care during the week. If this is what the Government aims to do as part of making the NHS a truly seven-day service then it should be honest with patients and doctors and say so."